Mostly recap, with a zany picture of Jonah being flung into the air. Ah, and we find out that Maria Lopez is taking a helicopter to check things out. In case you missed that, she is basically going into what is going to be ground zero for a super-fight (a lame one, but still a super-fight) where one of the combatants doesn't really care about collateral damage. Spider-Man has significantly more luck with helicopters than he does with any sort of villain, though. (See here for proof of that) I'm also a bit disappointed that the solid gold file cabinet has turned gray. Still confused about why there's a file cabinet there. 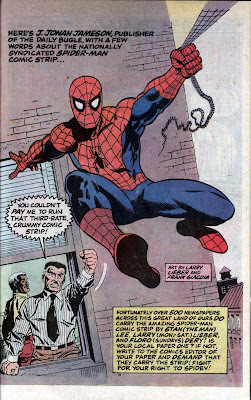 Also, I was reading some old Spider-Man comics (from the Evolutionary War crossover thing they did in the annuals twenty years ago) and found this little bit of fun: I would like to see an in-universe version of the Spider-Man comic strip. It'd no doubt be the most bizarre thing ever seen, if it was anything like that in-universe version of the Spider-Man comic book they did a while back. I could also rant about how they should continue to restrict massive crossovers like the Evolutionary War to annuals instead of inflicting them about the main books, but this is a blog about the Spider-Man comic strip. Not for rants on the comic books. Fallacies abound. First, as mentioned yesterday, it makes no sense for JJ to detain Peter. He should be ordering him out onto the roof! Second, he doesn't pay Peter's salary -- Peter is a freelance photographer. Third, why does Maria think she can get away with hijacking a chopper? Fourth, she's a big-deal talk show host on a major New York station that presumably has its OWN CHOPPER. It doesn't bother me so much that she wants to take a chopper into the battle zone; TV news crews do stupid stuff like that all the time. 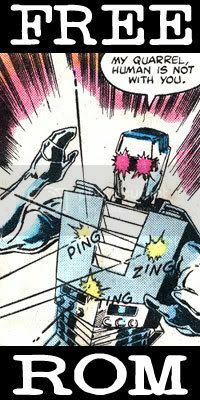 The gray filing cabinet's obviously the sterling silver counterpart to the solid gold model featured in the last few strips. Only the best for J. Jonah Jameson! Why the Hell would Vulture say to meet Spidey if they were the same, & this isn't the first time Vulture has been in New York. Hell, if Peter can get away with knocking Jameson to the ground, why doesn't he just knock him out for a while? He could even see the fight, MJ would just have to wake him up saying "Are you okay? You slipped and Peter went to get help. Hey, it's Spider-Man outside!"